Happy New Year! Did a new dog join the family this holiday season? Are you aiming to start a brand-new year with fine habits and manageable goals? 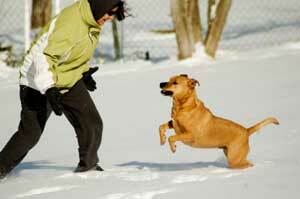 Is this the time to tackle you r dog’s problem behaviors, the ones that have had you perplexed? A solid foundation in positive training gets you off to great start, either with that new puppy or with your older dog. But training has to be more than just a foundation, especially if there are any undesirable canine behaviors on the scene. Consider the whole picture when it comes to behavior problems, and review the most common reasons a dog “behaves badly.” Understanding the common explanations for behavior problems is the first step in solving and preventing those problems. Mentally stimulating puzzle toys help eliminate boredom and keep dogs out of mischief. Often-forgotten mental stimulation is essential for a well-balanced dog. Mental exercise can be just as tiring as physical; someone who works at a desk job can be as tired at the end of the day as a landscaper. Utilizing your dog’s daily rations for food-enrichment activities or for a bit of training as often as you can will go a long way toward tiring your dog mentally. Something as simple as hiding your dog’s meal or spreading the food in the yard can be an enrichment activity. Dogs love to forage or work for their meals. Health problems cause behavior issues more often than people realize; health issues are often missed. Think about it—if you are not feeling well, you are probably going to be cranky or not yourself. Your dog is the same way, except a dog does not have words to tell you. Health issues that can change your dog’s behavior include arthritis, hip dysplasia, luxating patellas, sore teeth, thyroid problems, epilepsy/seizures, ear infections, digestive issues, skin or environmental allergies, yeast infections, hearing loss, eyesight loss, and cancer. If aggression or another behavior issue shows up suddenly, contact your vet. There is a good chance one of the above health complaints, or something related, could be causing your canine to be cranky. If you sometimes let your dog jump on you because you’re wearing casual clothes, but at other times punish him jumping, how fair is this to your dog? Dogs do not know the difference in clothing! This pattern, or lack of pattern, is very confusing for them and can cause anxiety. It reinforces jumping or any other behavior you are rewarding inconsistently. If you want your dog not to do something, be consistent by making that clear to him in a kind manner. If your dog jumps, for example, take time to practice sitting with positivereinforcement (providing something your dog likes such as treats or play immediately after the behavior) and ignore your dog completely if he jumps. Ignoring your dog means no talking, touching, or eye contact, as all are forms of attention and can reinforce behavior you don’t like. Cross your arms, turn your back, and ignore your dog until all four paws are on the floor. If your dog has a behavior problem, look to yourself—how do you respond? There is an excellent chance you have been reinforcing the behavior with attention, and may have actually trained your dog to perform that behavior! Another example of a reinforced bad behavior is barking. Dog barks, you yell, dog thinks you are barking along—look at the attention I got! Dog barks more, you scold more, dog barks more, and on and on it goes. Normal dogs bark, pull on leash, eat poop, roll in dead things, jump up to greet, guard food and bones (to a degree), growl when they are threatened, chew whatever they can get their mouths on, pee and poop wherever, nip, protect property or their family, herd, chase small animals, and sometimes kill small animals. All of these “nuisance” behaviors are perfectly natural parts of a dog’s repertoire, and vary depending on breed. Find a dog breed that is compatible with your lifestyle. It’s simply unfair to get a mastiff and be shocked when he barks at strangers approaching your home. These dogs have been bred for thousands of years to be guard dogs. Siberian huskies and northern breeds may not be reliable off leash and may kill small animals. Border collies might herd your children. Daschunds are known to bark a lot. These traits are due to selective breeding to perform a job or to natural canine behavior. Sometimes you can train an alternative behavior, and sometimes you cannot. It depends on how genetically hardwired the behavior is. Changing the routine can be stressful for your dog, and may cause your dog to act out. Just like us, dogs need a sense of security. Drastic changes in environment or routine can really throw them off, causing anxiety that is commonly expressed as problem behavior. Moving to a new house often causes a lapse in house training, among other issues. A change in work schedule can confuse your dog, and a new pet or child joining the family can also be very stressful. In all of these cases, be patient with your dog and guide him through the struggle with kindness while he adjusts to the changes. Switching your dog to a poorer quality or less suitable diet may also cause him to act up. Diet has a huge influence on behavior (going back to health influencing behavior). Switching your dog’s diet to something that is of poor quality or that doesn’t agree with him may change how the dog acts. Always feed your dog a high-quality diet, and change foods gradually over a week or so. Socialization is the process of providing your puppy positive, controlled exposure to other dogs, people of all types, sounds, surfaces, and new experiences. Dogs need to be socialized to the human world starting as young puppies and continuing throughout their lives. The period from 3-16 weeks of age is the most critical socialization period. This time lays a foundation for a well-balanced dog. If a puppy doesn’t get proper socialization during its critical period, it can grow up into a shy, fearful, or aggressive adult. A well-run puppy class can be a fun way to kick-start your dog’s socialization skills. Even a dog that has been well socialized can develop behavior problems after negative experiences. Being attacked by other dogs or teased by children when out in the yard are occurrences that can affect your dog’s behavior negatively. A poor experience at the vet, training class, or groomer can do the same. Be selective about where you take your dog to socialize and which professionals you trust to handle your dog. I would also advise against leaving your dog alone in the yard when you are not at home, as you never know what could happen. If your normally fearless puppy suddenly turns shy one day, don’t panic. 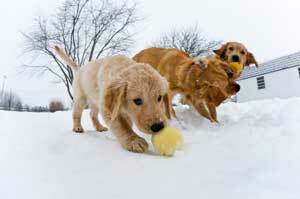 It is normal for puppies to go through several fear periods as their brains develop. The first generally occurs somewhere around 8-12 weeks of age and another period occurs around 5 or 6 months of age. Depending on the breed and bloodlines of your dog, your dog may experience more or fewer fear periods. Do not panic; just let your puppy go through this phase. You may want to avoid going to the vet, training class, groomer, or new places for a week until your puppy is back to his normal behavior. If during a fear period something frightens your dog, it imprints very strongly. So, rather than trying to work through a fear period, it might be best just to let it pass. Adolescence starts at about 6 months of age and usually continues to 12 to 18 months of age. Adolescence is when most dogs are turned over to shelters. This is a period when puppies start testing their world and their boundaries. A previously “good” dog may become a nightmare. Continued obedience training, maintaining structure and boundaries, patience, and skilled management are all essential practices during this phase. Management means setting up the environment so that the dog doesn’t get a chance to do “naughty” things, and includes techniques like crating the dog when you cannot supervise directly. Understanding common potential causes of problem behavior in dogs can make it easier to sort out what is happening with your own challenging canine. Eliminate each of the various origins of change, if possible narrowing down to a trigger for the undesirable behavior your pet is exhibiting. With more detailed information, you will have a better chance of eliminating the frustrating behavior quickly. 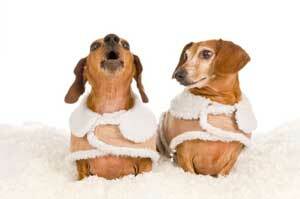 Of course, if your dog’s behavior problems are severe, look for a reputable trainer to help you.